Dan MonickFiona Apple did pretty much all anyone could have asked in 2012. Starting with a tense but triumphant comeback show at SXSW, she proceeded to release a stellar new record with The Idler Wheel Is Wiser Than The Driver Of The Screw and Whipping Cords Will Serve You More Than Ropes Will Ever Do last June and toured reasonably extensively behind it, though by late Fall she was cancelling dates to tend to her ailing dog. If that was the end of the promotional cycle for The Idler Wheel and the beginning of another hiatus, then so be it. Her inclusion on the initial lineup for the 2013 edition Primavera Sound in Barcelona was an encouraging sign that she wasn’t done yet, but that didn’t last. 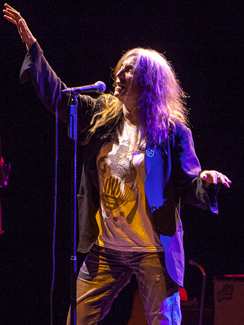 Then last week – more than a year after the first single and video from Idler Wheel was released – a new video emerged for the album’s closing track, directed by auteur and former partner Paul Thomas Anderson, and that was followed up earlier this week with the announcement of a new Fall tour. But not a conventional tour. For starters, Apple will be touring and performing with Los Angeles singer-songwriter Blake Mills, and as per the name of the tour – Anything We Want – the format of it promises to be free-form and unpredictable. One would assume that with the not-cheap ticket prices, they’re acknowledging that Apple’s exponentially-larger fanbase will make up the bulk of the audience and will be played to accordingly, but then again, maybe not. They don’t know, so how can we? In any case, Toronto is probably lucky that the October 17 date at the Queen Elizabeth Theatre comes a couple weeks into the tour, so folks should have an idea of what to expect by that point. Of course, if they’ve already shelled out their $49.50 or $69.50 for a seat, it’s kind of academic. But still. Portland’s Blitzen Trapper have announced details of the follow-up to 2011’s American Goldwing as well as accompanying tour dates. VII will be out on October 1 on their new home at Vagrant Records, and the accompanying tour hits Lee’s Palace a few days later on October 5, tickets $18.50. You can stream one of the new songs via Rolling Stone. Providence’s Deer Tick are also putting out a new record of their brand of Americana this Fall in the form of Negativity, due out September 24, and will also be hitting the road in support, kicking that tour off in Toronto at Lee’s Palace on October 10 – tickets for that are $22. They released a video for one of their new songs a couple weeks ago and are streaming another new tune via Rolling Stone. Pennsylvania psych-folkers Dr. Dog are also readying a new album for Fall release, with B-Room coming out October 1 – stream a new song below – and their touring itinerary in support of it runs pretty much the entire Fall, with the November 8 date at The Phoenix being one of the last. Tickets for that will be $22. Entertainment Weekly are streaming the whole of Explosions In The Sky’s soundtrack to the Prince Avalanche film ahead of its August 6 release date, just before the film opens on August 9. They play The Air Canada Centre on October 4, opening for Nine Inch Nails. Though you could be forgiven for assuming that we’d lost Tanya Donelly to the world of motherhood and domesticity – I certainly did – you would in fact be wrong. The former Belly/Breeder/Throwing Muse has been recording new music and will begin releasing it to the world in a series of monthly EP’s that she’s calling the Swan Song Series; the first volume will be available next Tuesday, August 6, via Bandcamp though those in the US with access to Pandora can apparently stream the songs in advance now. Lucky ducks. The Justin Vernon-powered Volcano Choir have released a new video from their forthcoming Repave, which is out September 3 and brings them to The Phoenix on September 8. Billboard talks to Neko Case about her forthcoming record The Worse Things Get, the Harder I Fight, The Harder I Fight, The More I Love You, out September 3. Stereogum chats with Lou Barlow about the return of Sebadoh, while The San Francisco Appeal talks to drummer Bob D’Amico and The San Francisco Bay Guardian to bassist Jason Lowenstein. They’ve released a stream of one of the new tracks and a video of another, both from Defend Yourself which comes out September 17. Pitchfork has some specifics about the new Cults record Static, which will be out October 15. Rolling Stone has premiered the second video for the first new Pixies song in ages, because if any band has mastered the art of miking it, it’s Pixies. Trivia: that’s not actually Kim Deal on the recording, it’s her replacement Kim Shattuck. Huffington Post has premiered a stream of the first new TV On The Radio music since 2011’s Nine Types Of Light. No info on the new album, but this is a start. Chicago Grid has a feature story on Wilco (the business). Beatroute and The Edmonton Journal chat with M Ward. The Creator’s Project have posted their mini-documentary on The Postal Service’s 10th anniversary tour. Consequence Of Sound talks to Superchunk and Mountain Goats drummer Jon Wurster about his recent commitment to sobriety. Airship Daily and The Huffington Post have interviews with Stephin Merritt about his work with Future Bible Heroes. NPR has a video session with Yo La Tengo. Because there is a Neutral Milk Hotel reunion, I don’t even need to try today. Will WestbrookGuys, in case it wasn’t obvious, running a music blog that tries to update daily is hard work. So when something comes down the wire like, oh, a Neutral Milk Hotel reunion, it’s not the sort of low-hanging fruit one passes up, even if everyone and their mother is reporting it. 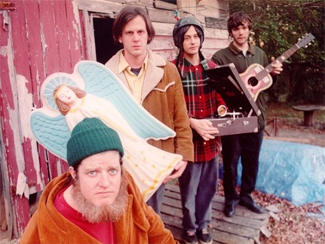 And so even though you’ve surely already heard, Jeff Mangum – having confirmed via his 2011 solo tour that people do indeed still care about his old band – has gotten Scott Spillane, Julian Koster, and Jeremy Barnes to reform the In The Aeroplane Over The Sea lineup and commit to tour dates this Fall. Presently, those tour dates number only five – two predictably at the 40 Watt Club in the band’s hometown of Athens, Georgia, one reasonably in Asheville, North Carolina, and two more bizarrely in Tokyo and Taipei. More will surely follow – one doesn’t open the door to something of this magnitude to just immediately shut it – but certainly not before those Athens dates in late October. And might this be paving the way for some new recordings…? Hey, one internet-breaking announcement at a time, alright? PopMatters talks to Tobin Sprout of Guided By Voices about their fourth post-reunion full-length English Little League, out as of today. She & Him have let NPR stream their new album, the cryptically-titled Volume 3, a week before it comes out on May 7. They kick off the Toronto Urban Roots Fest at Garrison Commons on July 4. Spinner has a feature interview with Charles Bradley, who leads his Extraordinaires into The Phoenix on May 11. Consequence Of Sound has details on a new Wild Nothing EP entitled Empty Estate due out May 14, a video from which has been made and released into the wild. Spinner talks to the Berninger family about the Mistaken For Strangers documentary about The National, which features and was directed by brothers Matt and Tom. The new National album Trouble Will Find Me is out May 21 and they play Yonge-Dundas Square for NXNE on June 14. Though he’s mainly focusing on his new record The Low Highway, as in this interview with Spinner, Steve Earle talks to Billboard about revisiting his past with the release of a box set collecting Train A Comin’, I Feel Alright, and El Corazon – the albums that got me obsessed with Earle in the first place – as well as a live album in Live at the Polk Theater and a live DVD in To Hell and Back, circa 1995 and 1996 respectively. The five-disc Steve Earle: The Warner Bros. Years set will be out June 25 and you can stream one of the Polk Theatre tracks below. The Fly has a feature interview with Parquet Courts, coming to town for a gig at The Horseshoe on July 17. Of Montreal took to Kevin Barnes’ Tumblr to announce the completion of their new album Lousy With Sylvainbriar, scheduled for release this Fall. Janelle Monáe talks fashion with MTV Hive. Her new album The Electric Lady is due out sometime this year. In conversation with Spin, TV On The Radio reveal they’re working on a new album and it won’t be for Interscope. NPR has a video stream of The Flaming Lips performing Yoshimi live, in its entirety, back at SXSW in March. 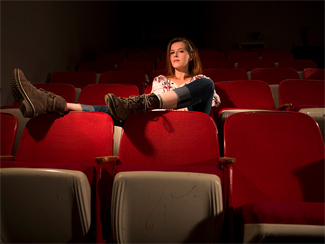 Yours Truly has a video session with Caitlin Rose. The Black Angels stop in at The Alternate Side for a video session and interview. NPR chats with Sam Beam of Iron & Wine. Here we are, another September 2, another year, another “oh my god am I still doing this” post. As far at themes go, I was torn between the good ol’ Eveready cat logo or some of Gustave Doré’s illustrations from the ninth circle of Dante’s Inferno – but I’ve gotten some grief lately over being a bit of a gloomy gus so I went with the cartoon kitty. And the “nine lives” bit? Maybe, but I’m certainly not on number one. So yes, still here, doing what I’m doing while noting that the landscape of things continues to change around me and the traditional-form blog, such as this one here, are becoming increasingly archaic. That’s cool with me; I can appreciate the vintage vibe, yo. And as I can feel a pointless ramble coming on, I will check myself and simply say that I have now been doing this for a quarter of my life and can’t remember not doing it… so for reading and validating that effort, I thank you. That’s about all I’ve got to say for this annual state-of-the-whatever post. Kind of weak, but don’t worry – I’ve already got next year’s decade post a-brewing. It’ll be a doozie. Did you know the traditional ninth anniversary gift is pottery and the modern ninth anniversary gift is leather? Me neither. So what else we got? The Independent has an interview with Emma-Lee Moss of Emmy The Great. NOW previews tonight’s Male Bonding show at The Horseshoe by talking with the band about their just-released second album Endless Now. The Boston Globe and I Like Music also have interviews. The Guardian has a feature profile on Laura Marling, whose third album A Creature I Don’t Know is out on September 13. She is at The Great Hall on September 23. Spin has posted up a video session with Annie Clark of St. Vincent, whose latest Strange Mercy arrives September 13. Aquarium Drunkard interviews the members of Olivia Tremor Control, whose reunion tour hits Lee’s Palace on September 16. Veronica Falls have released a new video from their self-titled debut, due out September 20. They’re at The Mod Club opening up for The Drums on October 1. And speaking of The Drums, they’ve released the second video in their Visiomento series promoting Portamento, out September 13. Spinner and The Irish Independent talk to Yuck, who will be at The Horseshoe on September 24. Slicing Up Eyeballs reports that the principals of New Order have put aside their seething hatred of one another enough to agree to release some outtakes from their last studio album, 2005’s Waiting For The Sirens’ Call though they’re still debating the exact format of the release. Live4Ever has an interview with Peter Hook, who brings his new outfit The Light playing material from his old outfit Joy Division to town for a show at The Phoenix on September 24. Rolling Stone declares Dum Dum Girls a “band to watch”, just in time for the September 27 release of Only In Dreams. They’re at Lee’s Palace on October 16 and if you missed it earlier this week – I added it to a post a little late – a second superb MP3 from the album has been made available to download. It won’t be here in time for his September 30 show at The Phoenix, but James Blake has announced the release of a new six-track EP entitled Enough Thunder for October 10; details at The Independent. Blurt has a feature interview with Explosions In The Sky, in town at The Sound Academy on October 7. Pitchfork reports that the release date for Bjork’s new album Biophilia has been pushed back from September 27 to October 11. San Francisco psych-rockers Thee Oh Sees have made a date at The Horseshoe for October 21 in support of this Summer’s Castlemania, though Prefix reports they’ve already got another album ready to go in Carrion Crawler/The Dream, due out November 15. I talked last week about how much I was looking forward to Welcome To Condale, the debut album from Summer Camp; well to go along with a brand-new website, the duo have confirmed that the album will have a North American release one week after the UK release on November 8. The Line Of Best Fit reports that Los Campesinos! will release their fourth album, entitled Hello Sadness, on November 15. And while that’s good news for fans, there’s also some bad news as it was announced via blog that violinist Harriet Campesinos! would be following in keyboardist Aleksandra’s two-year old footsteps and leave the band in favour of university and re-assuming her old surname. Perhaps that’s the sadness the album’s title is referring to? NPR has a World Cafe session with Anna Calvi. It’s amazing how small her speaking voice is, compared to how massive her singing voice is. Whew. She will be at Lee’s Palace on December 8. Also with a new clip are White Lies, from Ritual. American Songwriter rounds up some of the releases that will commemorate the 100th anniversary of Woody Guthrie’s birth next year, including but certainly not limited to a Wilco/Billy Bragg Mermaid Avenue box set.